The HTC One M9 comes fitted with a 1.5GHz Quad Core Cortex A53, as well as a 2GHz Quad Core Cortex A57 processor in its Qualcomm MSM8994 Snapdragon 810 chipset. The system even comes integrated with a 3GB RAM that lets you multitask at the snap of a finger. The integrated Adreno 430 GPU powers graphics applications like games without being afflicted by glitches and lag. Android’s advanced Lollipop operating system v 5.0, enhanced with HTC Sense UI 7.0, comes installed on this phone. This intuitive OS makes using this device a lot easier. 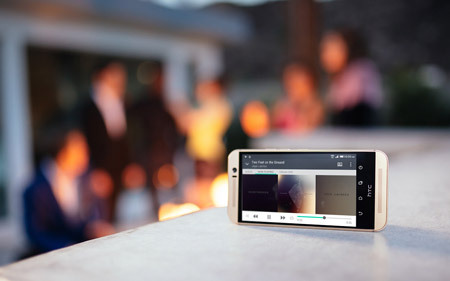 The HTC One M9's onboard multimedia options will surely keep you entertained while on the move. 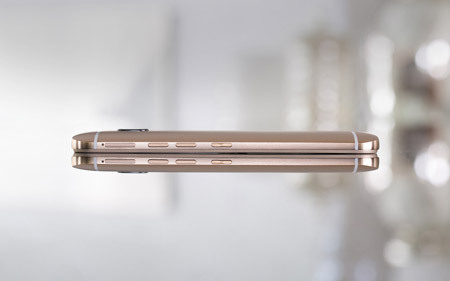 The gadget’s dynamic 20.7MP rear camera can snap up 5376 x 3752p photos and 2160p videos with stereo sound. A 4MP front camera lets you take part in crystal clear video calls or shoot incredible selfies. Android’s Lollipop operating system, which is enhanced with HTC Sense UI 7.0, comes installed on this phone. The device even features a multiformat media player and Stereo FM radio with RDS protocol that keeps you entertained and informed while traveling. All your captured footage can be edited on the mobile itself via its installed photo/video editor.